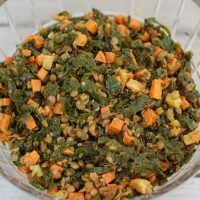 This Kale & Sweetpotato Lentil Salad is a hearty vegetarian entree or a delicious side dish to accompany chicken or fish. Disclaimer: I received free samples of California sweetpotatoes mentioned in this post. By posting this recipe I am entering a recipe contest sponsored by the California Sweetpotato Council and am eligible to win prizes associated with the contest. I was not compensated for my time. Nutrient-rich. Supporting star of Thanksgiving dinner. Now known as one word. That’s right. California sweetpotatoes are one word because they’re quite different from white potatoes and other sweet potatoes out there. Also, now’s a good time to set the record straight: sweetpotatoes and yams are not the same. Sweetpotatoes are sweet and moist; yams are dry and starchy (not to mention they’re not readily available in the US). California sweetpotatoes are grown in soft sand and are hand sorted during harvest to minimize scarring and scratching. End result: higher quality and more attractive sweetpotatoes. O’Henry: These tan sweetpotatoes look like white potatoes, but don’t be fooled! The white flesh is creamy, sweet, and ideal for soups and stews. They reminded me of a parsnip and when baked they were firmer than sweet potatoes I am used to. Diane: These red or “garnet” color sweetpotatoes have red skin and deep orange flesh. 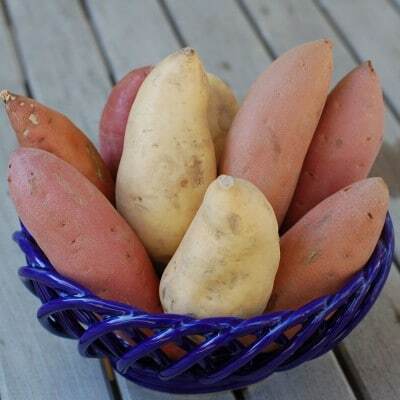 This variety is perfect for sweetpotato fries or creating a unique dish to add some color. Covington: These have rose-colored skin and super sweet orange flesh. They’re the type I am used to. Great for mashing and roasting. So now, the moment you’ve been waiting for: my California sweetpotato recipe! 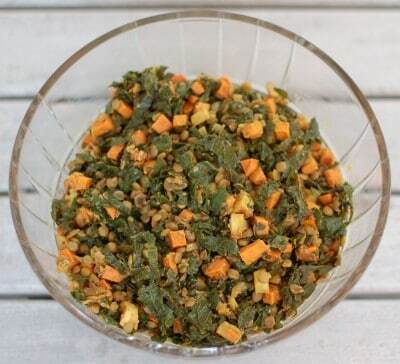 This kale and sweetpotato lentil salad makes for a hearty vegetarian entree or delicious side dish to accompany chicken or fish. Preheat oven to 400 degrees F. Toss cubed sweet potatoes with 1 tablespoon (3 teaspoons) olive oil and spread on a foil-lined baking sheet. Roast sweetpotatoes for 20-25 minutes, until tender, shaking pan one or two times during cooking. Meanwhile, heat 2 teaspoons olive oil in a medium pot over medium-high heat. Add the garlic and onions and sauté for 3 minutes. Add the minced ginger and sauté 1 minute more. Stir in the cumin and turmeric for 30 seconds. Add kale and ½ cup water and cook, stirring frequently, until the kale is cooked down. Remove kale and onion mixture from heat and transfer to a large mixing bowl. Place lentils, 1 cup broth, and 1 cup water in the pot, bring to a boil, lower heat and simmer covered for 20-25 minutes until water is absorbed and lentils are cooked, but not mushy. 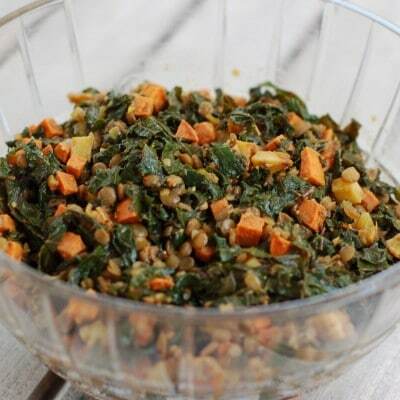 Combine lentils and roasted sweetpotatoes with kale mixture. Toss with dressing and season with salt and pepper. Serve warm or room temperature. This recipe makes 10 1-cup main dish servings. Looking for more sweetpotato recipes? Try my Sweet Potato Salad, Sweet Potato and Tofu Thai Curry, and Roasted Butternut Squash and Sweetpotato Soup. Also, come back later this week for another California sweetpotato contest recipe and check out my fellow ReDuxer’s recipes below! YUM! I’m not usually kale crazy but I just had to pair it with sweetpotatoes too this time around – can’t wait to see your next recipe! Thanks! I’m not either – in fact I rarely make it b/c my husband isn’t a fan. But I felt it was a perfect addition! YUMMY…this spice combo looks amazing! And love that you cook the kale…too crunchy for me otherwise! Thanks Serena! Totally agree about the crunchy kale!! Yum! This looks like the type of salad I could eat all week long for lunch. Love the combo of kale and sweet potato- one of my favorites! Thanks! I did just that! !